We launched issue #7 with a party at Protein this week. We brought together our readers, contributors and friends to have a few drinks to celebrate the collective greatness of the women in our latest issue. The BORN n BREAD girls got people dancing, Tanqueray and Johnnie Walker kept the bar well stocked - we served tasty Tanqueray & mint fizz and Johnnie & ginger twists. Everyone got their hands on the latest issue and gift bags with goodies from the lovely people at Mast London and Aesop as well as postcards featuring women from our modern icons series. 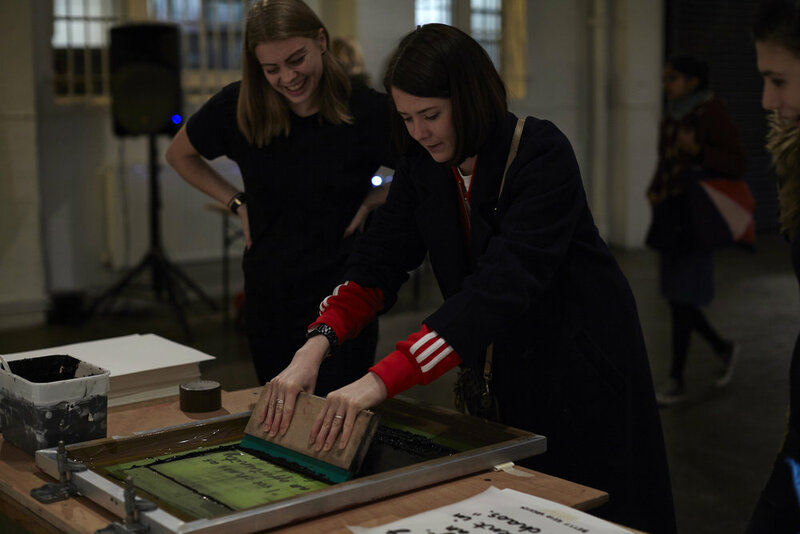 Print expert Sophie Kirk was on hand to help people have a go at screen printing their own print of the inspiring quote from our interview with Betty Reid Soskin, "I see chaos as an opportunity for change, there's an excitement in the chaos." If you couldn't make it down you can get your hands on your own copy here and check out our up coming events here. Thanks to everyone who came down to the launch, thanks to our team, to everyone at Protein, Tanqueray & Johnnie Walker, Aesop, Mast Brothers, Marcroy at People of Print and our print partners Park for all the support in making the launch possible.